Discussion in 'Requests for Proposals' started by tacotime, May 5, 2016. All proposals must be submitted by 06:00 PM UTC May 20th, 2016. 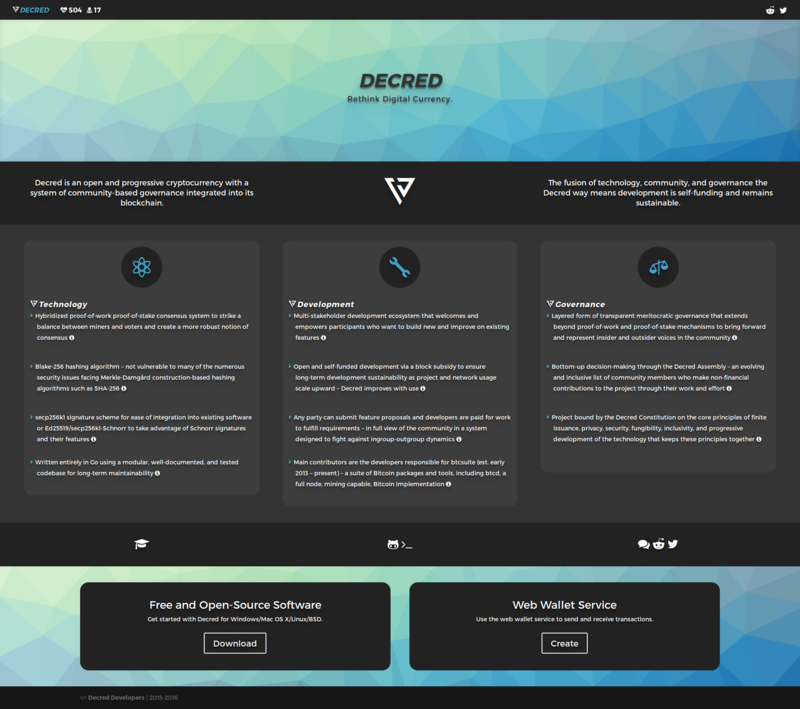 Decred needs to solidify a visual identity, align its different platforms in accordance with that identity, and redesign its landing site. This is important from a user experience perspective as the project continues to develop and mature. Without a visual identity that represents Decred across different platforms, new and existing users may not always recognise it and feel disengaged with its identity. A professionally designed Decred identity brings longevity, togetherness, and representation for it both as a cryptocurrency and as a project in any environment. Once an identity is established, alignment of different platforms with each other and with the Decred identity will be required. This will require modification of the different CSS components across the platforms listed (with screenshots) in Appendix A. 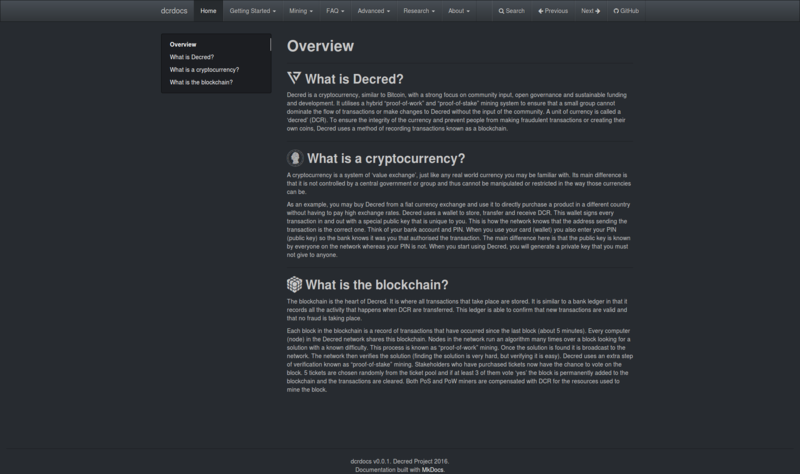 Finally, the main landing site for Decred requires redesign and implementation. A proposed foundation for the new landing site is the Solid theme for Jekyll, as it is blog-aware and includes relevant sections that allow for the showcasing of current and future Decred platforms as they develop. A screenshot of the current landing site is included in Appendix A. 4 weeks FTE or greater (1 FTE = 40 hrs/week). zero, 44blox, woot and 2 others like this. Personally, I like the blue/dark theme, and the logo is great, please don't touch the logo to whoever will get to do this job. Shadowlance, Noah, marcelocoin and 1 other person like this. marcelocoin and Tivra like this. I'm very curious to see the proposals. Could we have a community vote on which one should win? All in all a great project to work on, can't wait to see the progress! 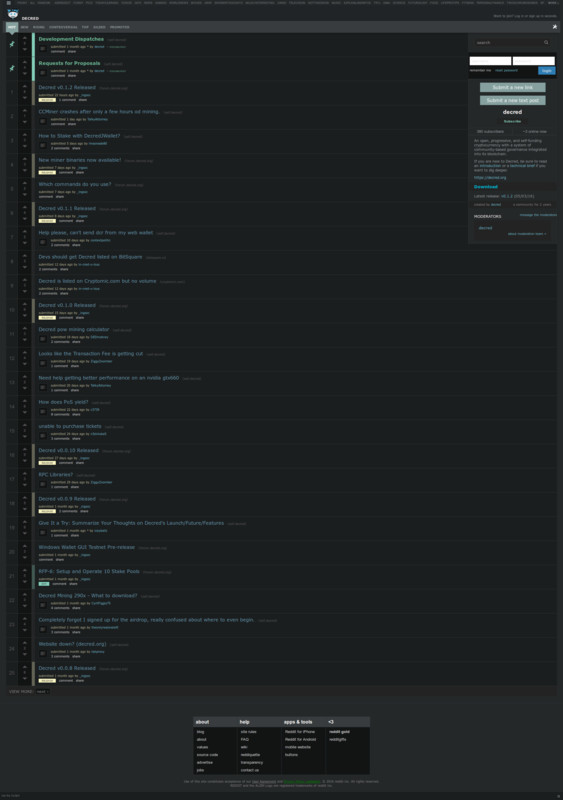 I would like to see the option to switch to a light theme on all the different platforms. 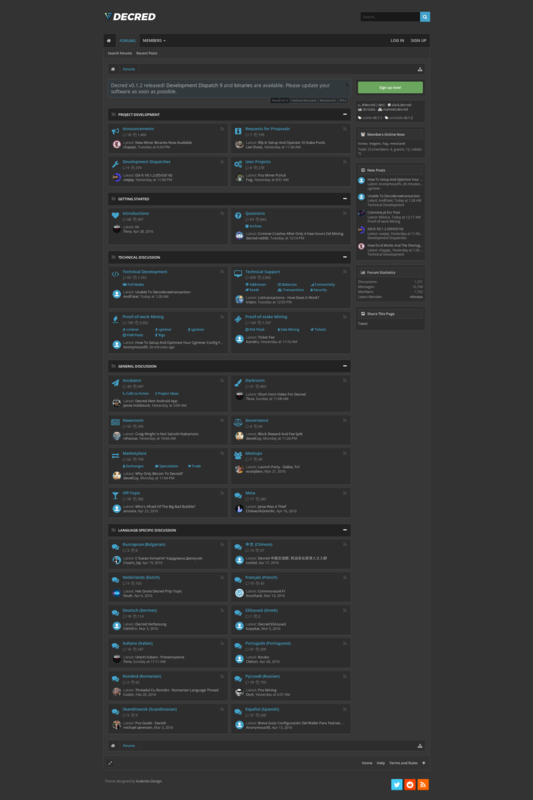 Or at least a not so dark theme using a lighter gray. Multiple themes would solve the problem. Switching from dark(decred sites) to light(most of the internet) is hard on the eyes. Lee Sharp, ZomaX, woot and 1 other person like this. Any updates on this? May we still send proposals? Closing date was 20th May, but there is no updates since then. Sorry about the delay. The reasoning this round was to get the contracts and paperwork sorted first before making announcements. So the closing date was valid. In the event that the RFP did not get enough proposals, a post will be made here to reopen the process. Thank you to everyone who submitted proposals. Congratulations to the talented design and visual communication team at EETER for their detailed and comprehensive proposal! They will establish an identity system, create designs for social media and other Decred platforms, work on the forum template design, create a new design for the landing site, and to top it all off, implement the various designs across these web sites. The project is honoured to have their involvement and interest in Decred! As a reminder to everyone else, please remember that the RFP process is a continuous one and the outcome does not say your proposal wasn't good. There will be more opportunities to get involved in different areas, and as the project has to adapt to different circumstances, new areas open up constantly that require attention. 418Sec, David, karamble and 1 other person like this. good news! It's very important step for bringing Decred to the masses.